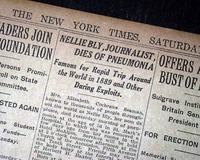 The following newspapers contain either articles written by or about Nellie Bly (Elizabeth Cochran Seaman). 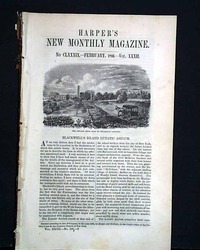 HARPER'S WEEKLY, New York, March 19, 1859 The front page shows: 'Hon. 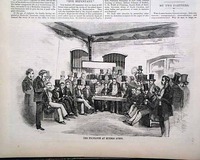 Daniel E. Sickles in Prison at Washington', who was the first person to plead temporary insanity in a murder case. 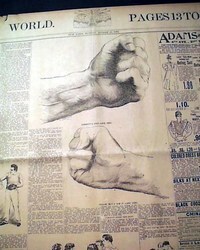 He would be acquitted. 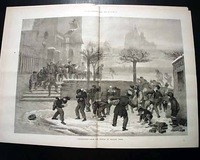 There is a related article on page 2 titled: "The Washington Tragedy". 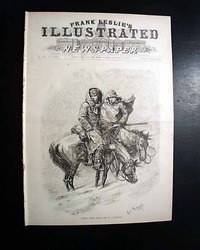 THE WORLD, New York, Jan. 11, 1890 Page 2 has the report on the return home of Nellie Bly from her round-the-world trip, an excursion which was sponsored by this newspaper. 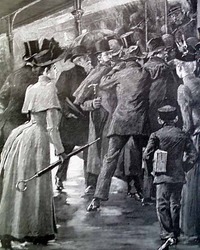 It also ran a contest to guess to exact length of time for her trip (see photo). 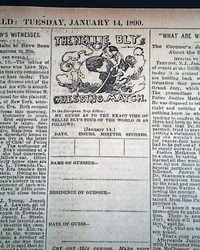 Page 2 has the report on the return home of Nellie Bly from her round-the-world trip, an excursion which was sponsored by this newspaper. It also ran a contest to guess to exact length of time for her trip (see photos). 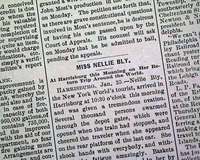 The back page has one column heads: "Miss Nellie Bly" "At Harrisburg This Morning on Her Return Trip Around the World" which reports on her arrival at Harrisburg and Philadelphia following her record-breaking trip around the world (see). 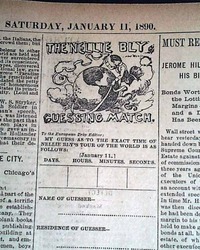 * "Nellie Bly Spars With Corbett"
Page 14 has one column headings: "NELLIE BLY, NOTED WRITER, IS DEAD", "Newspaper Woman Achieved Fame in Trip Around World". 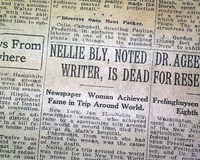 This is 1st report coverage on the death of famed New York World journalist, Nellie Bly.